Small rosettes, dark, glowing red in spring. 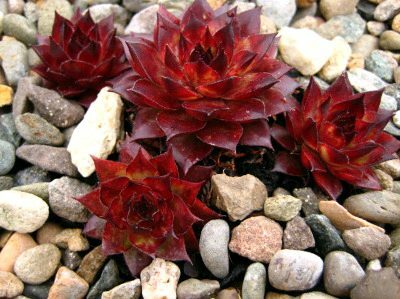 'Maria Laach' has small rosettes turning a glowing, shiny, dark reddish colour in spring with darker tips. Although small, it is quite prolific in producing offsets so makes good little colonies quite quickly. Like a smaller 'Bronco'. The smooth, glossy leaves make it very weather resistant. Ideal for planting in a stone trough with other small, slower-growing plants.